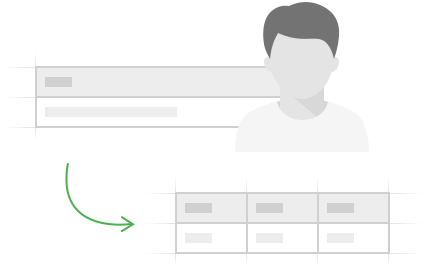 The tool makes it easier to divide full names you have in one column into multiple columns with regard to table headers. It recognizes first, last, and middle names along with over 80 suffixes and postfixes. You can tick off the name parts you need and get them in separate columns in a click. Pull out first, middle, and last names Split cells with full names into multiple columns. Get titles and post-nominals in separate columns The add-on recognizes over 80 titles, suffixes, and postfixes. 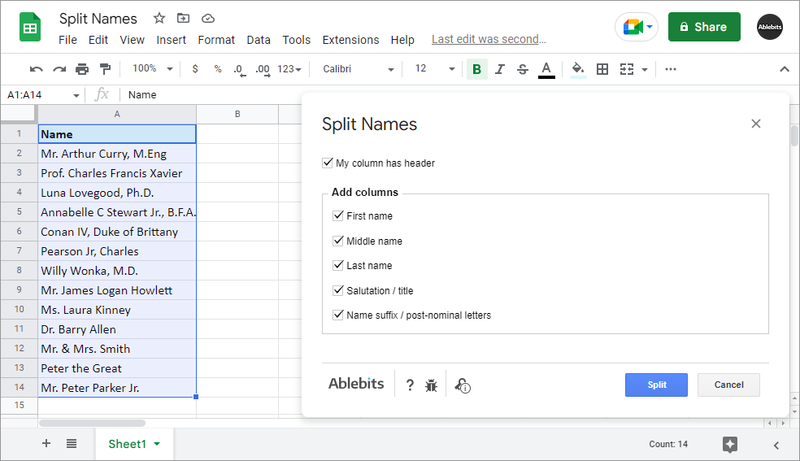 What is Split Names and what do I need it for? You've already guessed it from the tool's name, haven't you? :) The add-on pulls the name parts from a cell into different columns. It's smart enough to recognize first, middle, last names, salutations, titles, name suffixes, and post-nominal letters. The results will be placed in separate columns called after the name parts they contain. Doesn't Google provide a free way to split names? Well, Google has a useful option - Split text to columns. However, it can split cells by delimiters only, one at a time. If some names are written like "Dumbledore, Albus Percival", you'll have to split them a few times - first by comma, then by space. Besides, Google won't tell a last name from a salutation. It will simply cut the units at the order of their appearance. For our add-on, the name parts can be mixed. 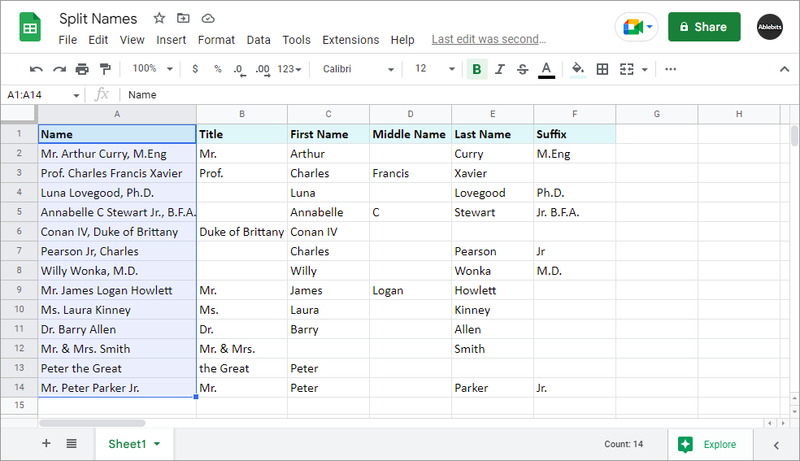 Your table can have suffixes or titles put before or after the names, and the parts can be divided by any combination of chars. The tool will still recognize any common name unit due to a thought-through algorithm of name recognition. 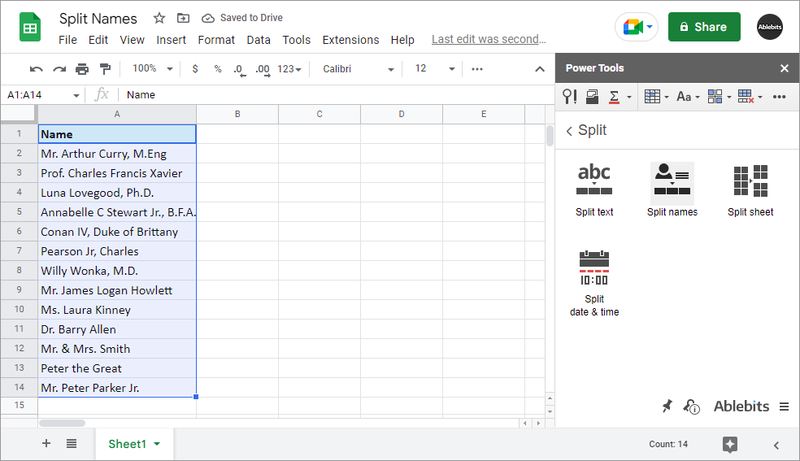 How do I separate names in Google Sheets? Run Split Names from the corresponding group in Power Tools. If the column with names has headers, check the corresponding box. Choose the name parts you need. Can I extract last names only? Yes, you can extract any part(s) from a full name. Just tick off the necessary options and you'll get the part you need in a separate column next to the full name. What if I have titles along with full names? No worries, our add-on recognizes titles and over 80 suffixes and postfixes.